Just because your style of music is not very popular in your country does not mean it is not more popular somewhere else in the world. It’s true, we don’t live in 1986 anymore, but some countries still do (I’m referring only to the fact that music styles that were popular in the US during the 1980s are popular in other countries). Speaking from my own experience, I sell about 300% more CDs in Japan than I have in the United States. I sell more of my CDs in Europe than in the US also (I have been there several times though). This trend of American high caliber guitarists selling more CDs overseas is widespread and very common now. We could all just get discouraged about the severe lack of popularity of great guitar music here in the US but that would probably lead most people to give up trying to make a living at what they really want to do. The best advice I can give you on this is: If people in your area can’t/won’t appreciate what you do then don’t try to force them. Move on and find where your potential fans are. If that means that you need to focus your efforts in Europe or Asia or anywhere else, then that’s what you need to do. Of course it would be great to have a lot of fans here in the US because that is the country that a lot of of live in and it is also the richest country in the world, but when it really comes down to it, who cares where your fans are going to be from. A fan is a fan. And besides, its really really cool to get CD orders, fan mail, fan e-mail, etc. write ups in guitar magazines and web sites from all over the world every day. The world is a very very big place, so even if a tiny percentage of the population would like cool guitar music, that translates into potentially hundreds of thousands (if not millions) of people. Marty Freidman now lives in Tokyo, Yngwie’s huge mansion estate is largely funded by his platinum album sales in Japan. Mr. Big (who became almost forgotten here in the US) were mega huge in Japan. Look how big classic heavy metal is in Germany (Manowar sells out stadiums there – they are bigger than Metallica!)! In China, I’ve read, disco is extremely popular (disco!) The point here is no matter what you want to do there will always be people somewhere that are going to think it’s cool. Let’s get back to talking about the USA. In recent years bands like The Beatles, Led Zeppelin, Black Sabbath, etc. have been selling a lot of CDs. Do you think its because people in their mid-30s to early 40s are buying these CDs now? Well that’s part of it, but a lot of the new popularity is driven by kids (teenagers). Why is this happening you ask? Because their parents grew up listening to that music and have turned their kids onto these bands. So what might that mean for us? Well think about what was the next generation in rock/metal music after these mid-late ’70s bands. Yes, it’s the 1980s. Back in the ’80s a lot of people started playing guitar and listened to cool players like Van Halen, Randy Rhoades, Yngwie Malmsteen, etc. That generation is older now and most have their own kids who are 5-12 years old, but it won’t be long before these kids get into their teenage years and start getting into music. My guess is that a lot of these kids will be influenced by what their parents listened to (the 1980s) and the ones that did play guitar may encourage their kids to play. All of this could translate into a new interest in great guitar players, not only for the older players like Yngwie and Van Halen but for great guitar playing in general. The new generation of guitar virtuosos may have a built in fan base in a few years that just needs a few more years to blossom. But the real issue here is how deeply is what you want to do in your heart? When it comes down to it, a true artist must follow his/her heart always. So in the end, it doesn’t matter what will sell or not, all that matters is that you follow your own desires and manifest those into reality on an artistic level. There are other ways to do this on an economic/career level, but whether that part is successful is not nearly as relevant to a true artists as the art itself. Having said all of that, the next issue for most artists is the practicality of paying to make your artistic music. Let’s face it, making good quality recordings and music is expensive, so unless you have a lot of extra money to spend on your art, you are going to need some money coming in to pay for it all. If you are looking for this money to come from your musical abilities, then you may need to do other things (separate from your art) to generate the money. Most excellent players end up teaching guitar eventually, but many resort to playing other kinds of music that will bring in money such as playing in a cover band, wedding band or another band that is already generating money that is popular. On a more professional level, getting on someone’s tour or album who is at least mid-level in the business (mid-level = means hundreds of thousands of CDs sold and on a label) or with an independent that is selling at least 40,000 CDs and doing some touring in specialized markets. There are, of course, many other ways in which money can be made in this business. Tom Hess is a successful professional guitar player, composer and the guitarist of the band Rhapsody Of Fire. 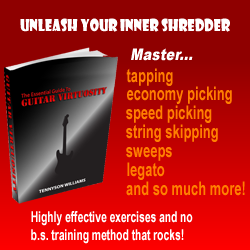 He also trains musicians to reach their guitar playing goals in his rock guitar lessons online. Visit his website, tomhess.net to read more articles about guitar playing, get free guitar tips and guitar playing resources.